THE SMOKY MOUNTAIN FIREFLY COMES OUT AT NIGHT TO PLAY! 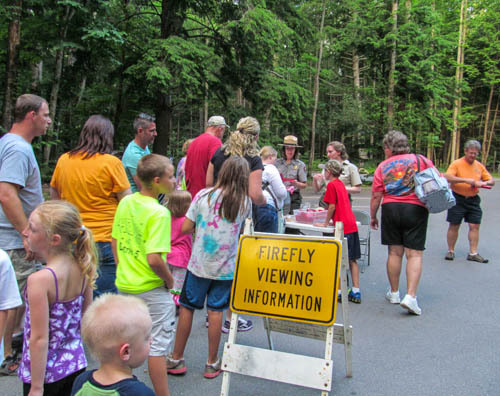 So why do thousands of tourists flock to the Great Smoky Mountains every year to see insects mate?? Because it's a show worth watching! These little creatures perform a ritual as never seen before! There are literally thousands that light. Once they get started, they do an amazing synchronized show in lightning patterns that becomes an amazement of nature that reaches beyond the imagination! There's nothing more beautiful on a starry summer night than the firefly lighting through the trees. It's a reminder of hundreds, or maybe even thousands of twinkling lights at Christmas. First, twinkling lights are dancing. Then, all at once it's dark! Then is an almost perfect synchronization they light again! It's really not something that can be captured. It's a natural wonder you must experience for yourself. It's amazing to see the beauty of God's handiwork come alive by thousands of little bugs with dazzling lights! Even in my own front yard, I refer to this lovely lightning as "God's Christmas tree!" Here in the Smokies, we refer to these little creatures as "Lightning Bugs." My favorite part of a summer evening is sitting on the front porch watching the lightning bug rise from the ground. They appear to delight the entire world with their radiant little flashes before disappearing into the trees. The Firefly is a special little guy here in the Smokies! That's because every year between the third week of May and the third week of June they celebrate their mating season here in the little town of Elkmont! There are only two places in the world where they gather! The Great Smoky Mountains National Park, and Southeast Asia. So what's going on here exactly? It's been said that the male flies around flashing while the female sits in one spot and flashes in response. In so doing, they manage to figure out who their mate is. Why the lights synchronize - nobody knows! It's a "God thing!" If you're planning your Smoky Mountain Vacation during late spring, or early summer, you might just catch the lightning bug in action. However, you need to plan early to get ahead of the crowds. Parking passes are sold at Recreation.gov in the form of a lottery. If you win, you will be notified and charged a fee of $20.00 , along with an additional $2.00 cash fee per person to ride the shuttle.. The lottery for 2018 is already closed. For more information, call Sugarlands Visitor Center at (865) 436-1200 for exact times and dates. Once you arrive, you receive printed information. You'll also get red cellophane to cover your flashlight, camera, phone, etc...(anything that may cause bright light) because brightness is disruptive to the firefly. 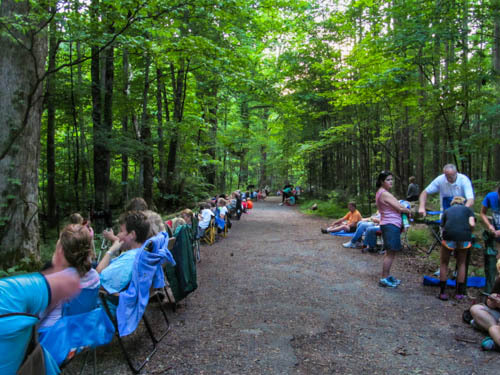 If you enjoy camping, Elkmont has a huge campground! It's one of the area's most popular camp sites! 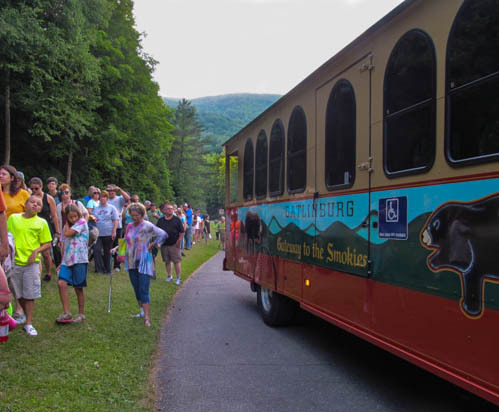 There are glorious views of the mountains, and full service accommodations complete with a stream perfect for tubing! Take your camera! Make sure you've got the good one! You'll need a good zoom because the lights are tiny, however, they're still brilliant! In the beginning you see a few blinks! The lights begin to grow...and after awhile, the show goes into full swing!